This post might get a little bogged-down in logic programming, but stick with it. I thoroughly enjoyed revisiting two articles last week by Adam Smith and Michael Mateas of the Expressive Intelligence Studio at UC Santa Cruz. 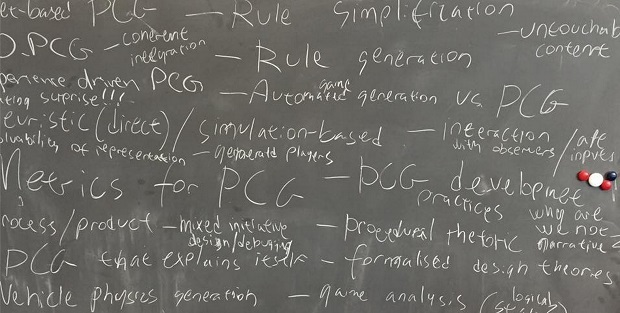 They’re both very readable – Variations Forever is an account of building a sort of self-designing arcade videogame, and the slightly more intimidatingly-titled Answer Set Programming for Procedural Content Generation is a superb article in an AI-for-games journal. I was turned back to these projects after some paper feedback pointed me towards Tanagra, another UCSC project (but a topic for another day). Both articles come highly recommended! Here’s what I took away from them.